Jasmit De Saffel, left, with MPP Sophie Kiwala. Jasmit De Saffel, Artsci’17, discovered the importance of volunteering and giving back to the community during her first few weeks at Queen’s. She received an entrance scholarship and had an amazing time during Frosh Week. Now she is getting something after giving back to Queen’s for the past three years. Jasmit is one of nine Queen’s volunteers to receive 2016 Ontario Volunteer Service Award. “Volunteers play such a vital role at Queen’s – whether it is serving on the Board of Trustees, organizing a class reunion at Homecoming, or hosting an alumni Branch event. Their dedication and tricolour pride help make this university great,” says Sarah Indewey, Queen’s Manager of Volunteer Relations and Reunions. Jasmit has volunteered with the Alma Mater Society, the Queen’s Student Alumni Association (QSAA), and is the former president of the Queen’s Indian Student Association. “I never volunteered for the awards. I did it because at Queen’s you can’t help but be involved. Queen’s has given a lot to me and I wanted to give back. I don’t have the financial capacity to give money right now so I do it with volunteerism,” says Jasmit, who is currently the QSAA president. 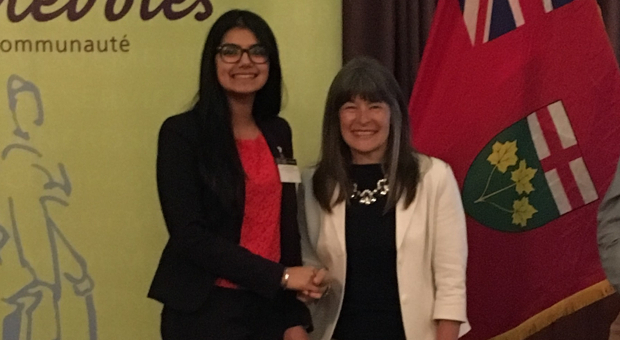 Ontario Volunteer Service Awards are organized by the Ontario Ministry of Citizenship and Immigration. This year more than 11,000 volunteers were recognized.